A few years ago, Nestlé Chairman Peter Brabeck-Letmathe made a statement that alarmed human right activists. He suggested there should be a price for water. "Personally I believe it's better to give a foodstuff a value," Braebeck-Letmathe said in a video that later went viral, "so that we're all aware it has its price." At the time, he was attempting to frame two sides of a divisive argument about water as a human right. "And then one should take specific measures for the part of the population that has no access to the water." Brabeck-Letmathe was forced more than once to clarify his position regarding the 2010 United Nations declaration that access to water is a human right. But, Nestlé's chairman said it's "not a free good." "People using the water piped into their home to irrigate their lawn, or wash their car, should bear the cost of the infrastructure needed to supply it," he explained in blog post a few years later. Well, the Council of Canadians, a nonprofit social action organization based in Ottawa, is calling Nestlé on those words. In September, after Nestlé outbid a small town in its access to drinking water, the Council declared war against the water bottling company. In a strongly worded petition, it called on consumers to boycott Nestlé. "This summer, many parts of southern Ontario faced drought conditions." In addition to purchasing the water rights the township of Wellington Centre said it would need to survive Ontario's current drought, the bottling company was also accused of endangering the city of Guelph, Ontario, which relies on groundwater for its drinking source. "Yet Nestlé, a giant bottled water corporation, continues to pump more than 4 million liters of groundwater every day from an aquifer near Guelph," the Council states. But it isn't just the fact that Nestlé continues to draw large volumes of water during drought conditions. It's the price the company pays that has many Canadians up in arms, as well. 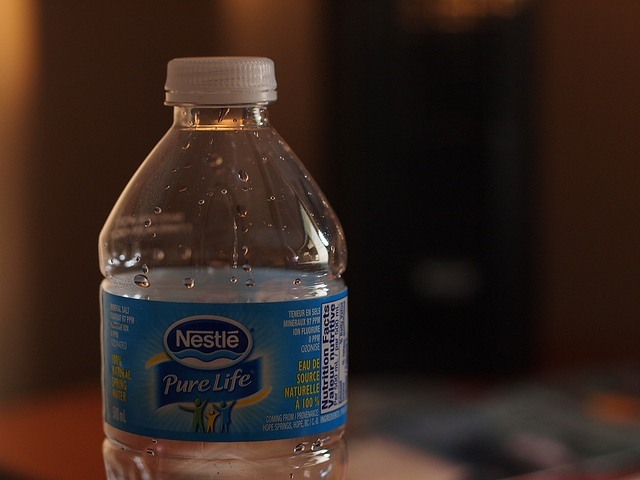 According to the Council, Nestlé pays less than $4 per 1 million liters, what comes out to less than $15 a day. Once it's bottled and marketed, the liter bottle can be sold for more than 10 times that price in Canada. Nestlé's access to ground water resources is becoming a controversial issue in many parts of Canada. Last year, while wildfires raged in parts of British Columbia, protesters launched their own call for a review of commercial water-taking policies. At $2.25 per million liters, British Columbia's water access fee is even lower than Ontario's, making it almost "free" for companies that see a profit in bottling and selling Canada's water. "The issue isn't just bottled water; it's that we allow companies to drain our water table for what amounts to free," wrote Joshua Ostroff, senior editor of Huffington Post Canada. From sodas to beer, Ostroff says manufacturers have had virtually unlimited access to Canada's aquifers, without reasonably paying for its resources. "It's time to disrupt the entire beverage market's business model, which is to extract an ingredient for basically free and sell it for an absurd amount." With pressure mounting from environmental and human rights organizations, BC and Ontario began reviewing the pricing and permitting steps for commercial water taking. It's too early to tell whether either province will change its policies regarding Nestlé's commercial access -- or whether they feasibly can. Raising prices for water access or placing a cap on commercial extraction could be problematic for cities and areas like Guelph that also benefit financially from the drink manufacturer's local water processing plant. Still, the lingering problem for Nestlé may be the way environmentalists and human rights organizations are interpreting its stance on water and human rights. No matter how many different ways the company phrases its support of the U.N. resolution, it has yet to convince many listeners that it fully supports water as a human right. Unfortunately for Nestlé, its recent outbidding of a town's drinking water source is likely to make that claim all the harder for some Canadians to hear.